His Grace Bishop IRENEI is scheduled to preside at the Divine Liturgy on April 7th, 20th & 21st. 7 – Dinner in the church hall after Divine Liturgy. Fish allowed. All are welcome. 18 – Confession before Unction from 5:00 pm. 19 – Unction at 6:00 pm: His Eminence Archbishop Kyrill presiding. 21 – Palm Sunday: Dinner in the church hall after Divine Liturgy. Fish allowed. All are welcome. 27 – Blessing of the Paschal baskets: 1) at 11:15 pm & 2) after the Paschal Liturgy (early morning April 28th). 29 – 2nd Day of Pascha: Liturgy, procession, pot-luck, Easter Egg Hunt. 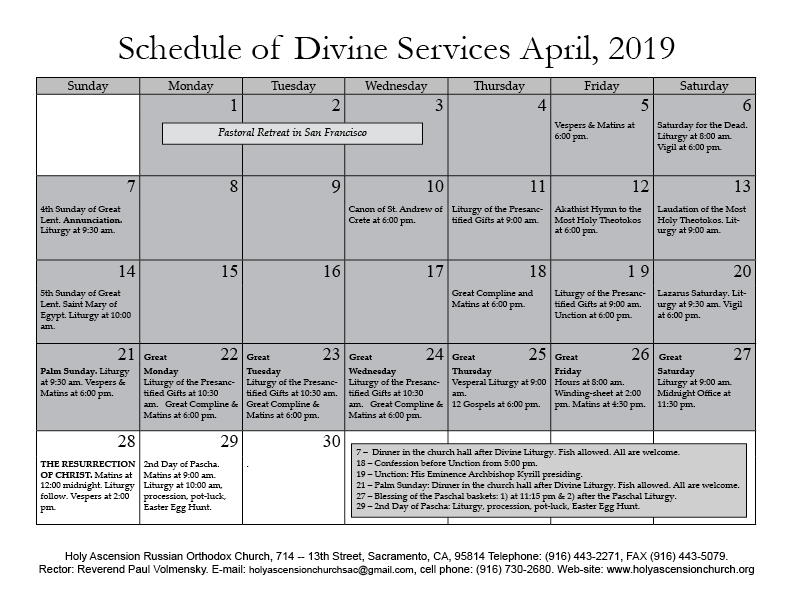 Print the calendar for April, 2019, here.